It will be convenient to have a name for the ideas which are esteemed at any time for their acceptability, and it should be a term that emphasizes this predictability. I shall refer to these ideas henceforth as the conventional wisdom. John Kenneth Galbraith, Economist, 1958. 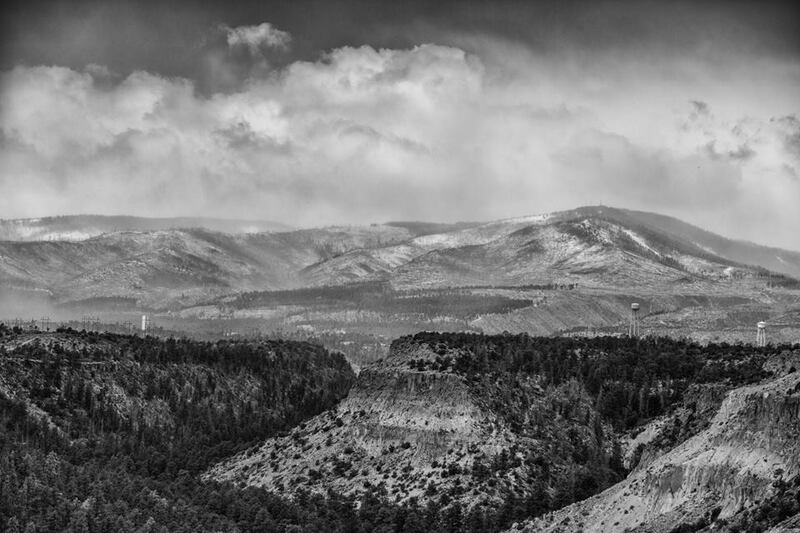 Stephen Lee ( Dark Glass Photography) photograph of a late April 2014 snow dusting of Pajarito Mountain. 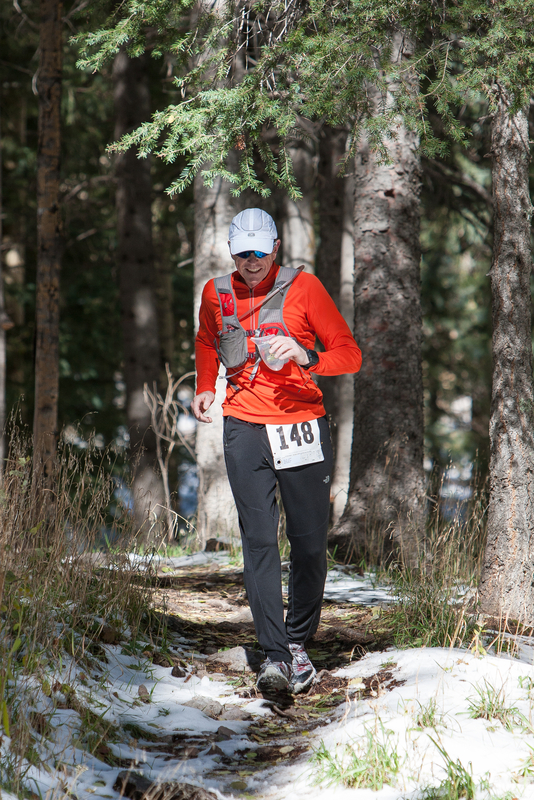 The 2014 Jemez Trail Run 50 km and 50 mile runs will climb Pajarito Mountain and top out at its 10,440 foot elevation. The Jemez Trail Run is one of the reasons I “got into” trail running. Conventional wisdom is an ancient high idol – it has been used to guide and misguide people from the beginning of time. Conventional wisdom is sometimes right, sometimes wrong, but nevertheless shapes core values and beliefs. The power of conventional wisdom is that it sounds right and thus quashes skepticism – even among scientists. It is surprising how often conventional wisdom turns out to be wrong, or at least miss-applied. In my case, conventional wisdom gospel collided with a passion to run on mountain trails. Nowhere is conventional wisdom more often evoked than with all things to do with health. This is mostly because the human system is so complex that there is a natural desire to deconstruct it into smaller, simpler, components. Often the conventional wisdom is based on some scientific evidence; however, medicine has a long history of poorly understood experiments. Dr. John Ioannidis, one of the world’s leading medical statisticians states that up to 90% of medical studies that are published in leading research journals are flawed – mostly because variables are not controlled or hypothesis tested were biased to desired outcome. In other words, a prescription based on a “medial study” was actually likely to be wrong…… Although this is harsh, it is not really a criticism of your local physician who is only repeating the oft-cited medical journal results. It is stunning how often medical journals publish papers which have totally opposite conclusions. My personal favorite are studies on whether coffee is good or bad for you – a simple google scholar search yields results for hundreds of studies – and the score? Coffee might be good or might be bad for you. It is good for me, I can assure you.. I had my left hip replaced in 1998 at the tender age of 42. It was a life-changing event for me. It relieved me of great pain, but it also came with the stern instruction that I could not participate in any high impact sports again. 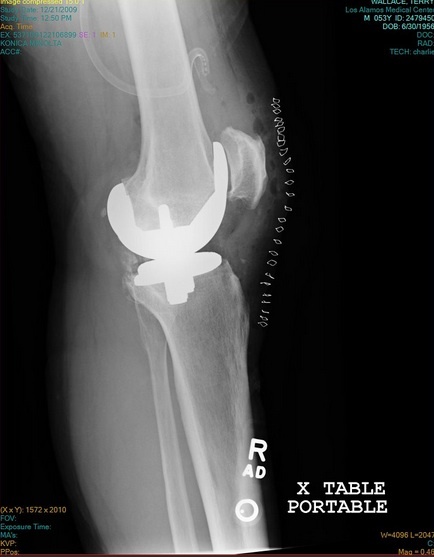 In 2009 I had my right knee replaced. Again, the pain it relieved was a godsend, but I was told that my “bionic” state was subject to wear, and it was only a matter of time before I would have to have the metal joints redone. The only way to delay the return to the surgeon’s table was to minimize impact – no running, jumping, skiing, parachuting, etc. I totally bought into this physician direction – it certainly made sense! However, life was not that simple for me. I could ride a bike and I could swim; but that is not what I wanted in my life. I loved being in the mountains, on a trail, climbing a peak. I discovered trail running, and found a special joy. I started slowly (well, I am still a very slow runner, and will always be), but besides the spiritual peace I found with trail running I began to feel physically better than I had in decades. Back pain disappeared, my non-replaced knee stopped aching, and I felt like a “million bucks”. At some level this made no sense, but I began to wonder if the knee replacement and the fitness from running had corrected a long present biomechanical problem. Trail running in New Mexico is far different than road running — the trails are rough so there is no rhythmic pounding. There is lots of “stepping” in climbs and descents. I was pressed by many who care about me to stop the nonsense of trail running or risk the wrath of prosthesis fatigue. I decided to really investigate the facts behind the prohibition of running with artificial joints, and was extremely surprised to find that conventional wisdom was based on flimsy evidence. Running in the Jemez Mountains after an early fall snow. The peace and joy of nature is an immeasurable factor in quality of life. I have always enjoyed sports – almost every sport I tried. I am not athletic, but I am dedicated. I enjoyed running, cycling, football, etc., but after high school my passion was basketball. I am short and slow, but if you play enough you will have seen everything and experience is a nice equalizer. For 25 years I played basketball at least 4 times a week – and played hard. Conventional wisdom says that if you play basketball regularly then you will be injured regularly….a stray elbow, a turned ankle, a jammed finger. I believe that in this case conventional wisdom is a universal truth. Along the way I had several knee surgeries to remove torn cartilage, and my knees began to really get sore. But not sore enough that I wanted to give up playing. In 1989 I was given a prescription for indometacin (a non-steroid anti-inflammatory), and the daily doses meant that I could run up and down the court. In 1996 I began to get numbness in my left foot, and finally went into a doctor to find out what was wrong. After a number of diagnoses, mostly wrong, my hip was x-rayed. In the words of radiographer “I had the hip of an 80 year old arthritic man – heavily scored and damaged”. Only way to stop the pain was to get a total hip replacement. My response was emotional, but the real issue for me was “why?”. The answer always came back the same – sports damaged your joint. I accepted this conventional wisdom, but today I believe it is far more complicated that just “sports”. My hip xray 11 years after replacement. The two common modes of failure are wear of the ball joint, and separation of the stem from the femur. Neither mode is present in the slightest after a decade. Recovery from hip surgery was not actually that difficult. I was riding a bike within 10 days, and I could not believe how much better I felt. Mostly, I remember that I could finally sleep through the night! My knees still hurt and I was limited in my hiking. I never played basketball again (but had to avoid going any where near the Bear Down Gymnasium at the University of Arizona for fear that I would be sucked into a pick up game). Over the next ten years my knees slowly got worse. My kneecaps seemed to grow (they are/were huge), and finally in 2009 I followed the advice and had my worst knee (the right side) replaced. Getting a knee replaced is much, much more difficult than a hip. It took a long time to recover and be pain free. Along the way, both my parents died, Los Alamos was evacuated due to the largest wild fire in New Mexico history, and my job seemed to consume me. I gained weight, and physically began to feel old. I decided to start climbing the hills around Los Alamos – slowly at first, but pretty soon I was trotting. I lost the weight, but much more surprising, I the aches and pains I attributed to age began to ease. By the winter of 2012 I was feeling physically strong, and able to do 20 to 25 mile trail runs with no ill effects except exhaustion. Xray of my right knee shortly after surgery. The “picket fence” on the right side of the image are the staples to close the incision. 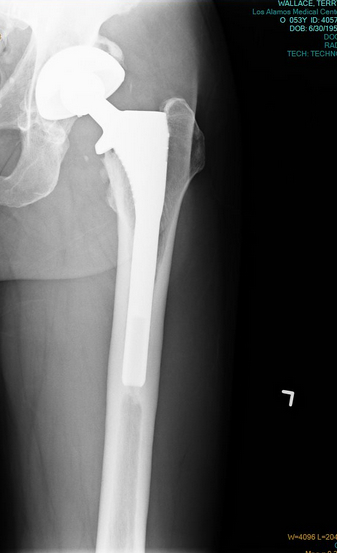 The replacement includes implants both on the femur and the tibia bones. The knee cap is also reshaped and spurs and growths were removed. Artificial hips and knees are relatively common place in the United States; earlier this year the total number of prosthetics was estimated to top 7 million with a ratio of 2 knee replacements for every hip (in fairness, most of the knee replacements are “partials” vs total). The owners of these replacements are skewed towards those over age 60, although the demographics is shifting to younger ages rapidly. It is very difficult to get good statistics on the failure rates of the prosthetics; there are different kinds, and all have peculiarities. On average, about 2 percent of artificial hips fail or need to be replaced after 5 years, and about 6 percent after 15 years (so more failures early). 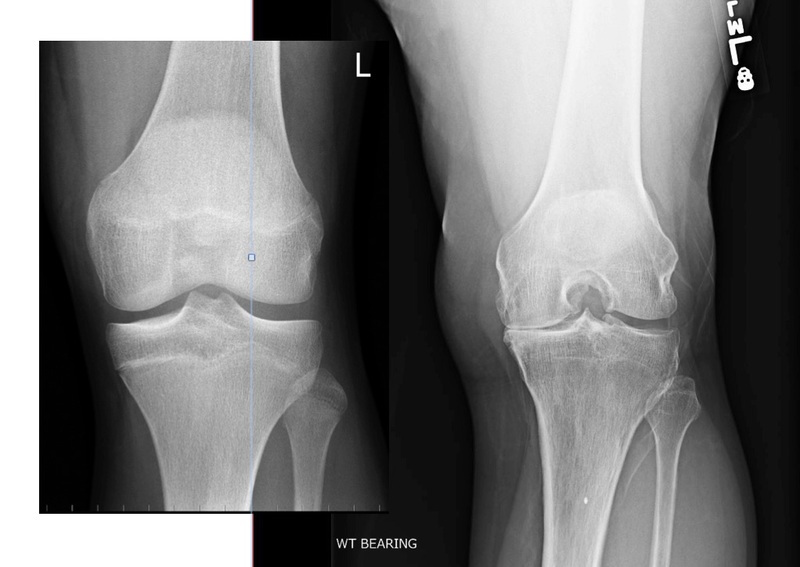 For knees, the 15-year failure rate is slightly lower, about 5%. The statistics for these failures are robust. However, there is a paucity of large scale, longitudinal studies examining the cause of failure. Most reports are largely anecdotal, and the overwhelming correlation is with obesity and inactivity, which would seem to be counter to conventional wisdom. There are two oft-cited studies that made an attempt to examine prosthetic failure to physical activity. The first is a 2010 study presented at the American Academy of Orthopaedic Surgeons that looked at knees. The sample size was small – 218 patients – but it found that those that ran after surgery were 20 percent less likely to have mechanical failure. The second study was done at the Sainte-Marguerite Hospital in Marseille, France and had a similarly small sample size: 210 patients, with 70 “active” in high impact sports and 140 that were not and focused on hip replacements. The metric was “survivability” of the hips 15 years after replacement. 80% of the active sports participants had high performing hips, while 94% of the low activity participants had high performing hips. This would suggest that high impact sports had a negative impact on the prosthetic – the opposite of the 2010 study. So, who is right? Is there a difference between hips and knees? Is there a difference between French and Americans? I have read both studies, and a number of analysis of these studies, and am struck by the very poor quality in control of the complex variables. Different types of artificial hips (metal-on-metal, coated metal, etc) were mixed, there was no quantification of level of activity other than self reporting, and there was no details of the type of failures. At best, it would seem to indicate that there is NO EVIDENCE that running is worse than walking for the survivability of hips and knees! The simple gaits of running vs walking. When running force or stress increases and decreases throughout the gait and involves a transfer from the foot/ankle to the knee to the hip. If the studies are ambiguous about whether running causes prosthetics to fail, where does the conventional wisdom come from? The best explanation is in biomechanics – the human engineering of running. The gold standard for biomechanics is a 1997 review paper by Tom Novacheck, The biomechanics of running (a pdf can be found here: http://www.elitetrack.com/article_files/biomechanicsofrunning.pdf). Stress is generated and transferred to the body in several ways. With the first strike (FS in the figure above) the full weight of the body comes into contact with the ground – impact stress – and is transferred up through the ankle to the knee and into the hip. The running gait then pushes the body off the ground (Toe Off, of TO in the figure), which generates a similar set of stresses. The stresses on the joints are a combination of the weight of the runner and the contraction of the muscles. Force on impact during a running gait. There are two keys: body weight and length of time in contact with the ground. Experimental studies have quantified the forces on a runner as the foot strikes and then leaves the ground – the figure above is a classic “average runner”. The first little peak is due to the shock of striking the ground and then some of shock is absorbed in the padding of the running shoe. 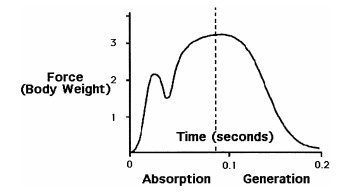 The y axis is the nominal force which is scaled to the body weight; it pays to be a light weight when running! There has been much work done to see how this force load is accommodated within the body, and the classic “average human” works the hip, knee and ankle — and does this differently for walking, running and sprinting. This figure is shown below. The difference between walking and running is dominated by the engagement of the knee – in the graphic the overall stress is indicated by the size of the pie chart. In simple terms, more stress when running, and that stress is really experienced in the knees. The partition of energy (stress x time) between leg joints for walking, running and sprinting. It is this figure more than anything else that drives the conventional wisdom that running wears out prosthetics. Running generates more stress than walking, and this leads to the conclusion that higher stress results in more wear. But why? That is not true in bone – in fact, for bones increased stress promotes growth and stronger joints. Although metal, ceramics and plastic can’t “grow”, aren’t they engineered to withstand the modest stresses of a 155 pound man running at the leisurely pace of 6 miles an hour? The question of running and artificial joint wear is murky, and there is no strong evidence that modest running leads to more wear. I am confident that my trail running is not accelerating my demise. On the other hand, I am equally confident that eventually my knee and hip will eventually deteriorate – maybe when I am 65, maybe when I am 70, but it will happen. However, the quality of life trumps the possibility of extending the prosthetics a few years. I feel I can answer the question I get all the time — aren’t you concerned that you are ruining your artificial joints by running on the trail? The answer is “not really”. I believe that my original joint arthritis was not caused by “sports” but by a biomechanical misalignment within my body. Surgery corrected that (probably unintentionally) — it is a gift. I celebrate that gift every trail run. The surgeries did effect me in other ways – cut nerves, changed muscles, and made me weaker. I will never be a fast runner, but that is just fine. Conventional wisdom says a “happy man is a healthy man”.